I am coordinating an art journal round robin over at Milliande: thirteen women from around the world work in thirteen journals with thirteen different themes. Today I am working in Gabby's journal from England. Gabby has chosen the theme "Surreal" for her journal. I must confess at first this was one of the more difficult topics for me. So I started out by looking up the definition of surreal: unexpected juxtapositions. bizarre. And just like that comes my inspiration for this journal: the Winged Horse of Le Pont, Switzerland, it is one of the most surreal things I have seen and one that has left a lasting impression on me. So imagine then this lovely Swiss landscape if you will: in the foreground a small lake only barely 10km long and a background of gently rolling wooded hills dotted with old houses that, rather than impose on the landscape blend in. Now imagine a 14 meter high concrete Pegasus statue placed in this lake. There are no soft rounded lines in this sculpture, no, it is made of sharp angled raw concrete form work. There is not an extraneous line on this winged equine, the whole animal has been pared back to its essential lines and planes to give it its shape. Its only organic concession are the lichen that grow on its base. 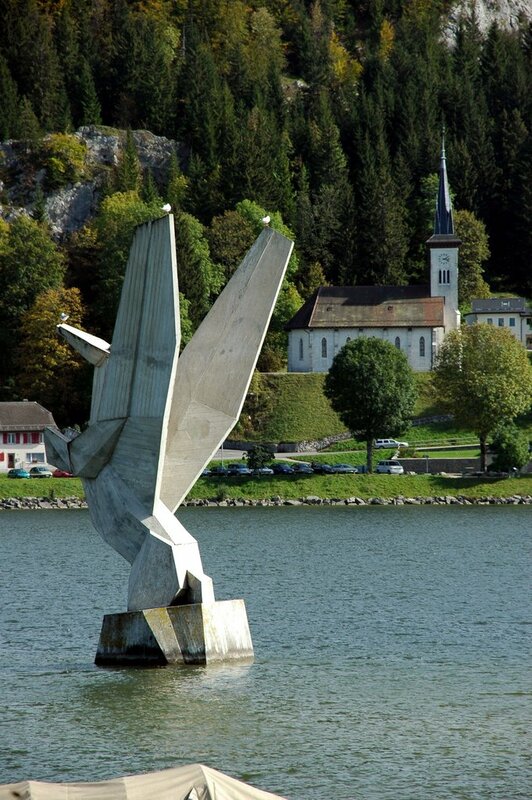 The statue was a gift from the Forces de Joux (the local energy company), the Pegasus symbolises water sources. This seems an instant where the gifting company becomes more important than the artist who actually created it, but after much research I find the name of the artist: André Lasserre. The official title of the artwork is Cheval ailé (Winged Horse), which he created it in 1959. I first glimpsed this winged abstraction at the tender age of nine or ten on a family holiday in Le Pont. It seemed eerie to me and a little scary. And I must confess I did not particularly like it. Nevertheless it made a deep impression on me and even years later this winged horse sometimes appears in my dreams, not as the scary beast of my childhood but rather as an old friend that I enjoy seeing again. So this is my creation in Gabby's art journal, a loose interpretation of the winged horse and its surroundings. I used pen, Pitt pens and water soluble wax crayons. I enjoyed loosing myself in the many angles and facets of the winged horse and in trying to draw it, I became aware that the lines and shapes are more complicated than they look and I have come to appreciate André Lasserre's vision. I would like to think that I am shaped by the art that I love, that which is beautiful. But I am coming to the conclusion that art that challenges me and pushes me out of my comfort zone can be just as influential. As much as I would like to dream of Del Kathryn Barton's, Rothko's, Klimt's, or Frida's works which I all truly admire and love, I appreciate André Lasserre's Cheval ailé's appearences in my dreams. Monika you write so beautifuly. The sculpture is amazing in its simplicity and is so striking. 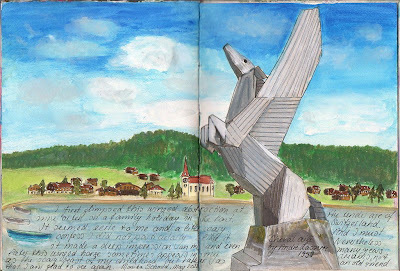 I love your interpretation of it in the journal page. lovely entry Mon, I also struggled with this theme, its a tricky one. Your writing and art are very inspirational. I really enjoyed reading this post.